This year Boyfriend and I made boxes of chocolate as Christmas presents, to go along with the tins of peppermint bark. This idea had been percolating for a few months. After the first batch of chocolates turned out so well, I asked Boyfriend if he wanted join me in making chocolates together. He thought this was a good plan, so we spent a few evenings drinking cocoa and playing video games as we worked out the details. How do you make fillings for chocolates that won’t spoil? Mousse was out. How do you make coloured fillings when somebody has an anaphylaxis reaction to food colouring? Would the chocolates survive being transported from Toronto to the east coast on the VIA train? First, we did some stealth research on family preferences, and started brainstorming what flavours to make, and how to make them. Neither of us had made chocolate fillings before, but how hard could it be? We decided that Boyfriend would make the fillings and I would temper the chocolate, and by the magic of team work, they would come together into one glorious confection. Oh, hubris. 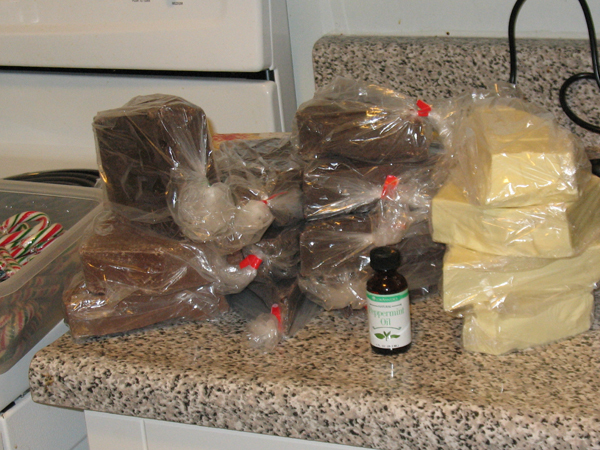 Second, we ordered supplies: silicon moulds, flavouring oils, boxes, ribbon, and photo-quality paper. After coming up with a rough estimate of how much chocolate was required, I hit up the farmer’s market and purchased seven kilograms of Belgian chocolate; milk, dark, semi-sweet, and white. Third, after the boxes arrived, they had to be assembled. This was a lot harder than it sounds. Boyfriend saved the day since I had no idea what to do. Once the boxes were ready, I designed a label and he affixed it to the box. Fifth, practice run! Filling chocolates was brand-new territory, I wanted to experiment to get the technique down. I tempered a batch of chocolate and we got to work. 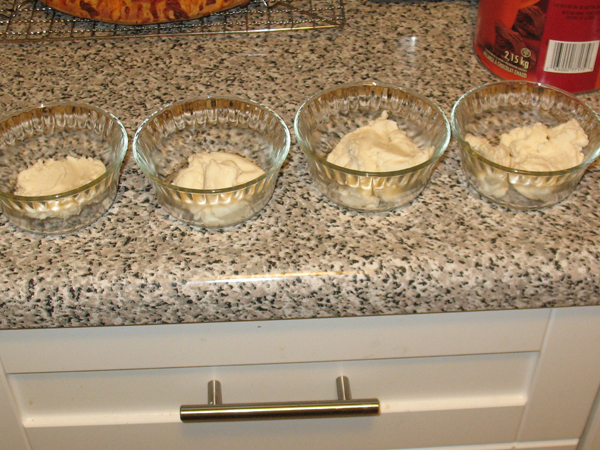 To make the fillings, Boyfriend mixed up icing sugar, butter, and evaporated milk in Nemo the KitchenAid, and then divided into 4 bowls, which he flavoured accordingly with: orange cream, peppermint, and raspberry. 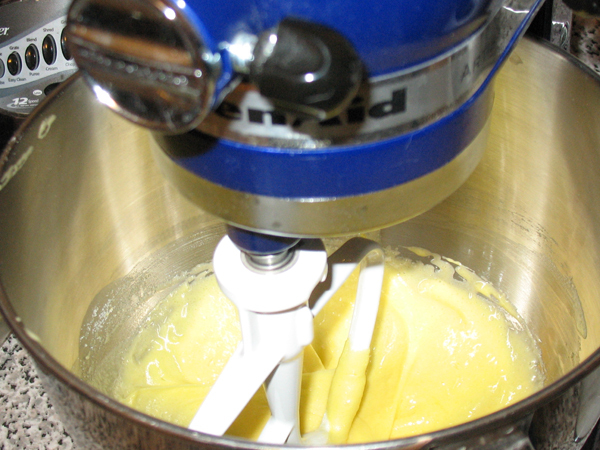 To get the buttercream, he kept one bowl aside without any extra flavouring ingredients. The peanut butter filling was chilled, rolled into balls, then placed in the freezer. For the other filled ones, I made a simple ganache, by pouring scalded cream over milk chocolate, and over Toblerone pieces. Once the chocolate was tempered, I poured a little chocolate into the bottom of the moulds, he put the filling in, and I topped it up with more chocolate. 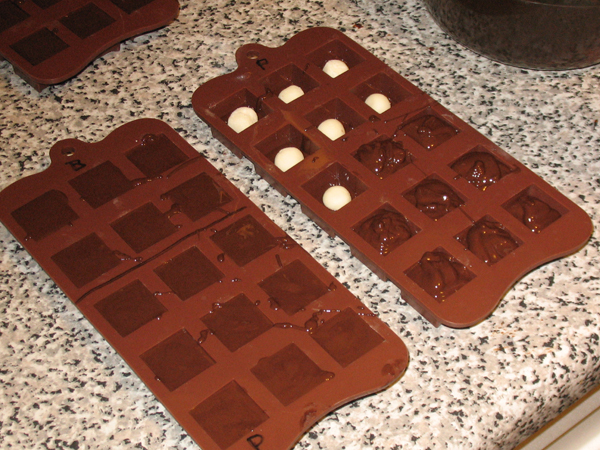 We shook the moulds to settle the chocolate, and back into the fridge. 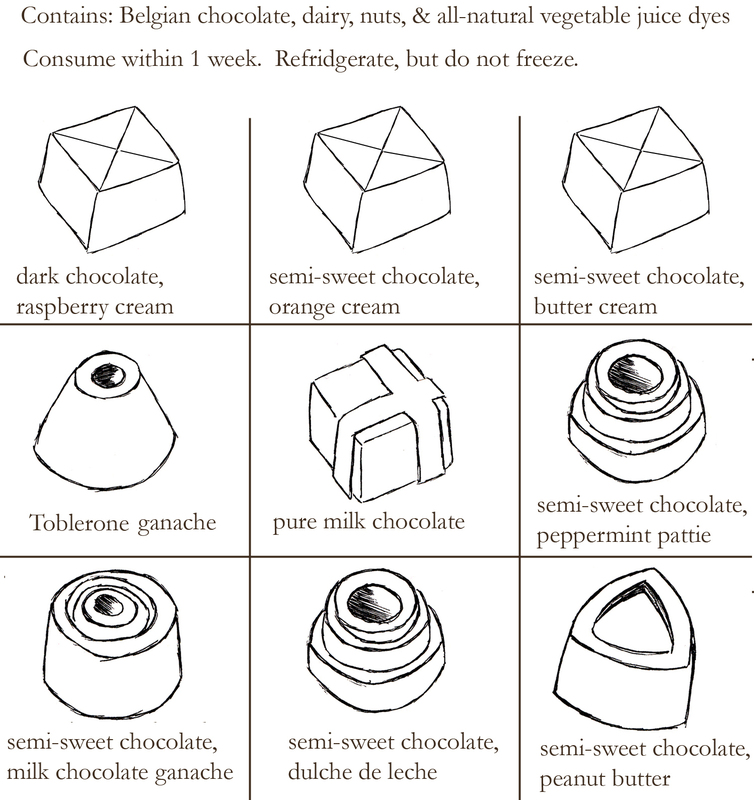 After the test chocolates set, we put half in the fridge, and left the rest on the counter, to see how they held up at room temperature. After a week the chilled ones were fine, the others has degraded a bit, so that was good to know. Six, it was time to make the first batch of real chocolates. Armed with what we learned from the test trial, we made a batch of chocolates for Boyfriend’s family. Everything turned out wonderfully, aside from the Toblerone ganache which collapsed. However, it was the tastiest one. After spending the weekend with his family, we came home and went to work on round 2 for my family – which would be shipped on the VIA train. Back to the drawing board on the Toblerones, and decided to skip the ganache this time, and just melt and mould solid Tolberone, which held up much better. The brown triangle in the top left corner is the label, which I have blurred out, but it says the name of our chocolate company, so to speak. The lovely ribbon I was so excited about? Completely forgot to use it until today. The map was a little bit off. We had planned to use the tiered square for 3 flavours, but ended up with 4 in that shape, and the milk chocolate ganache and the dulce de leche were reversed. Oops. 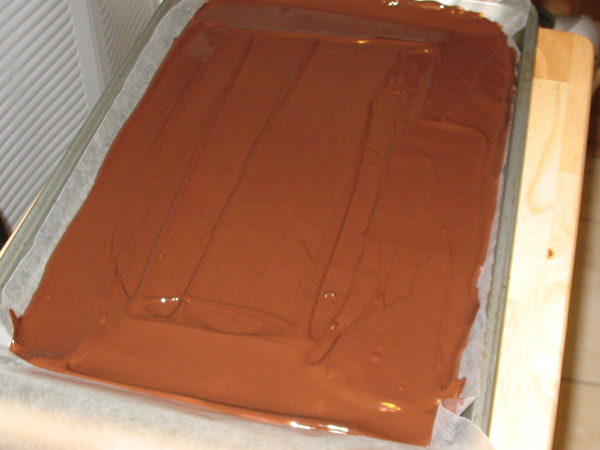 I think my idea for Toblerone ganache is still a sound premise, but I’m going to have to keep tinkering. Placing the ganache fillings into the chocolate was really tricky, the fillings oozed out a bit, I’m not sure if adding more liquid to the ganache would help or not. For next year, I’ll make sure I have at least 2 copies of each mould so we can make 30 per flavour at a time. I’ll also start a few days earlier, got a bit distracted and left some things to the last minute. 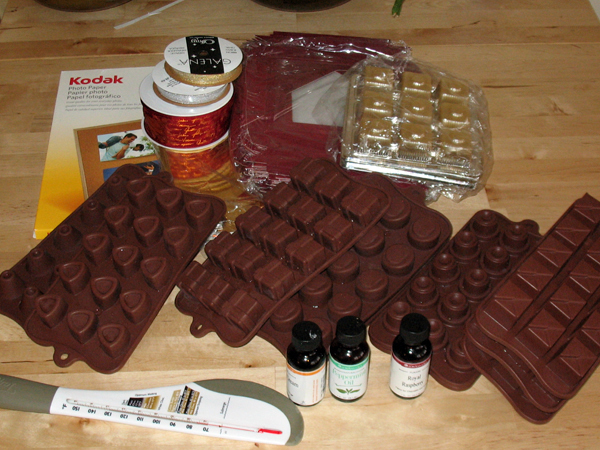 The LorAnn flavouring oils and Fat Daddio’s silicone moulds came from Golda’s Kitchen. 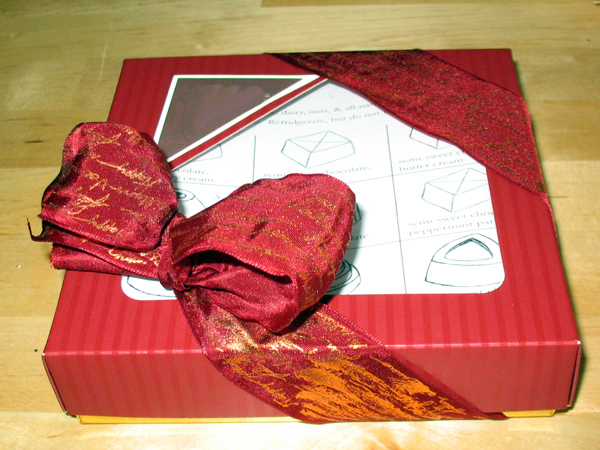 The boxes and ribbon came from Chocolat-Chocolat Inc. The Callebaut Belgian chocolate came from Domino Foods in the St. Lawrence Market. The Kodak photo paper came from Wal-mart. Both online orders arrived promptly, and had been packed with care. I’ll order from both companies again. For reasons I cannot fathom, Boyfriend loves eggnog. I do not, and when someone offers me a glass of eggnog, I have terrible flashbacks to a night involving a childhood illness and my father’s questionable decision that eggnog was what the doctor ordered. Ugh. 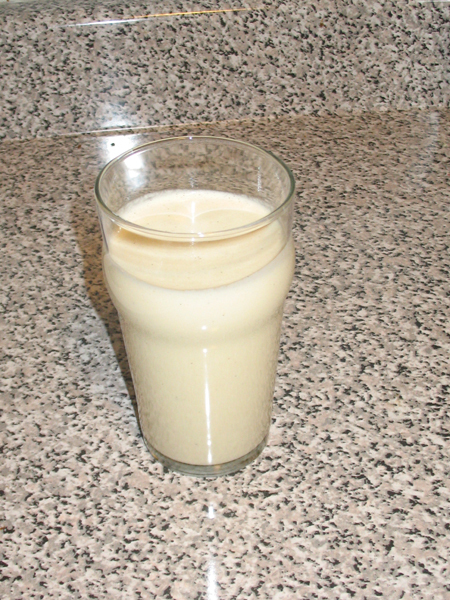 To this day the thought of drinking eggnog makes me queasy. A few days ago Boyfriend bought some eggnog, but he drank it all and has been moping around. 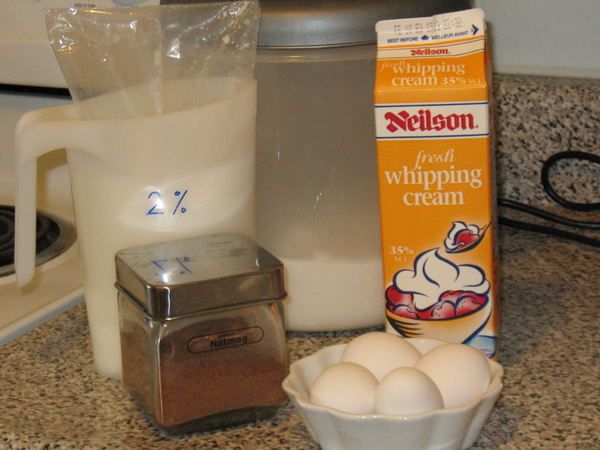 In a burst of Christmas generosity I was moved to make homemade eggnog for him. I googled around until I found something that looked promising. I made a few changes to the recipe. 1. 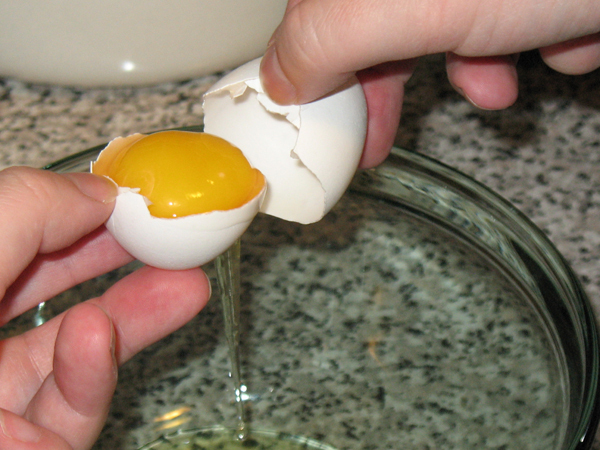 Separate yolks and whites. 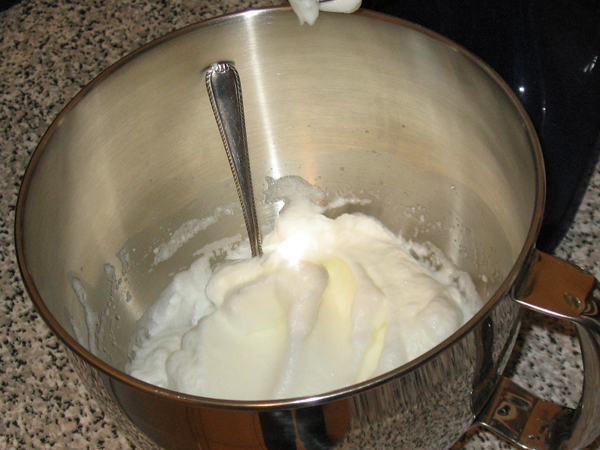 Place yolks in mixing bowl, set whites aside for later. 2. Beat yolks until colour lightens. 3. 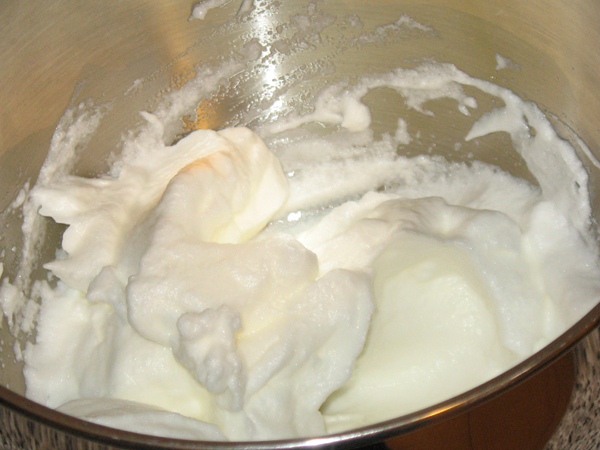 Gradually add ⅓ C of sugar to the yolks, beat until thoroughly dissolved. 4. 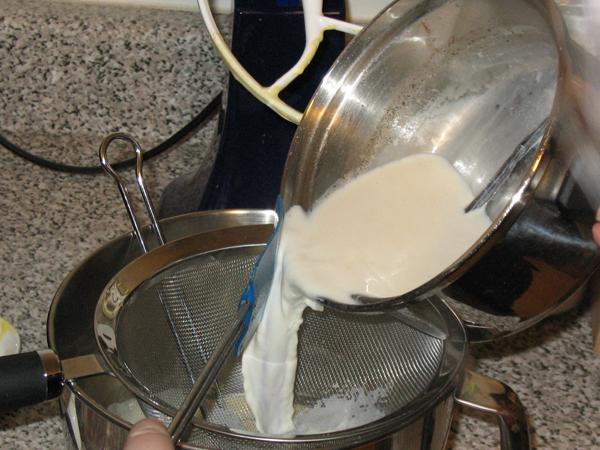 In a sauce pan, add milk, cream, nutmeg, and vanilla bean. 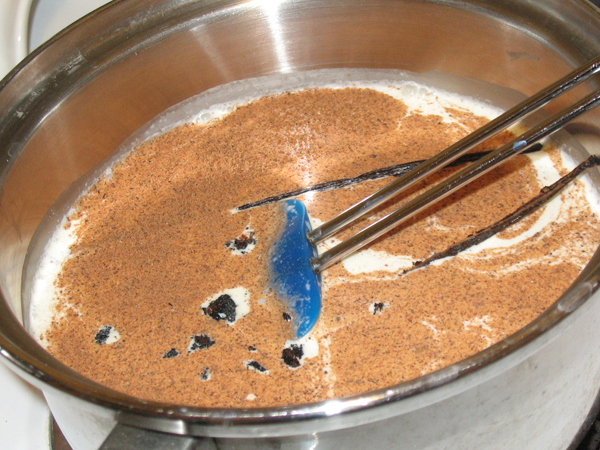 Scald mixture, then remove from heat. 5. 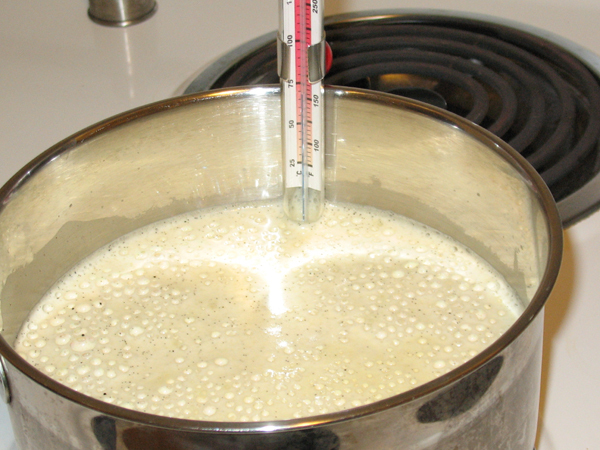 Strain and temper hot cream into yolks, adding about one third at a time. Don’t forget to stir. I forgot to stir, and I got a scrambled eggs on the bottom. Oops. 6. 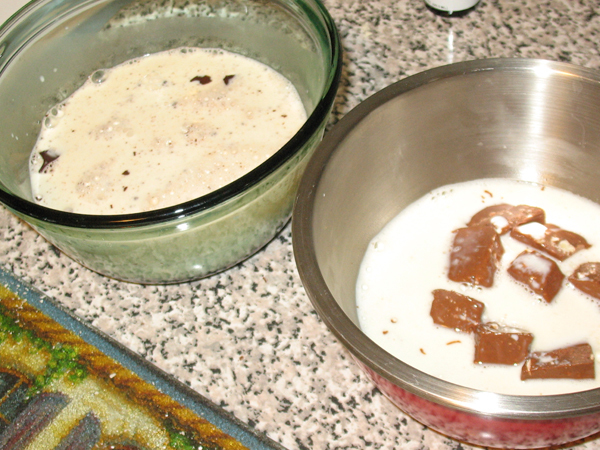 Remove from heat, transfer to mixing bowl, and chill. 9. 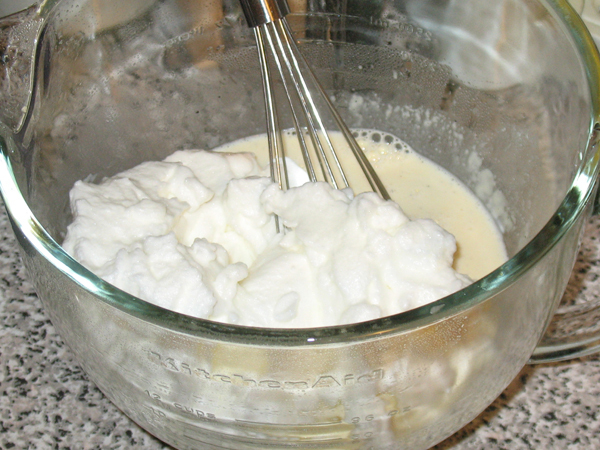 Whisk whites into chilled mixture. 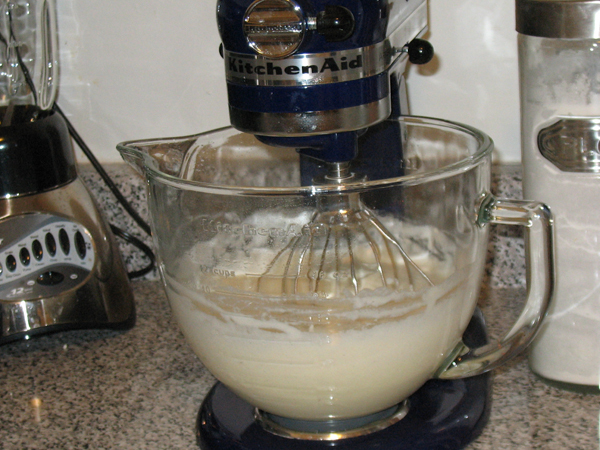 Whisking got boring so I used the wire-whip attachment in the mixer to do this for me. 10. Chill and… drink I guess. Boyfriend assures me it was delicious. I’ll have to trust his judgement, I have no intentions of drinking that swill. 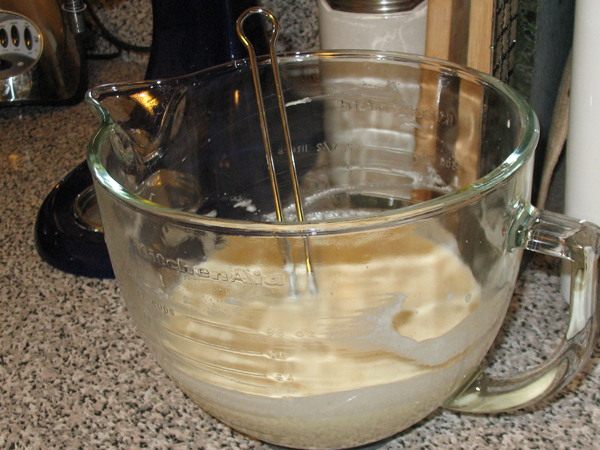 After he drained the glass I confessed that I didn’t stir it enough and found eggy mixture in the bottom. I send it to my family and Boyfriend’s family. This year, I wanted to make bark, plus a surprise that Boyfriend and I collaborated on. The surprise will not be unveiled for a few days, but I’ll teach you how to make bark today. 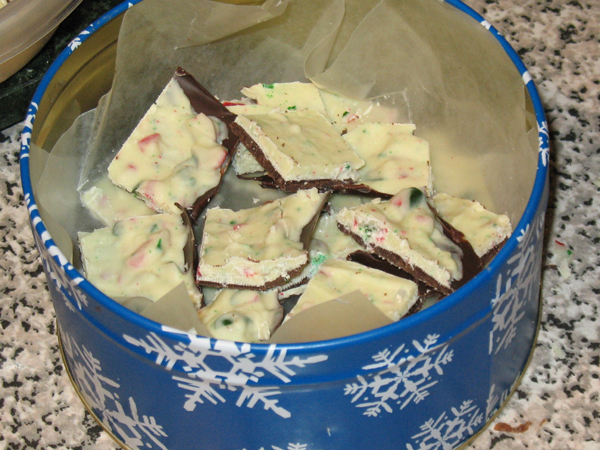 One popular bark flavour is using all-white chocolate with red canes, but I prefer a bark that is 2 parts white chocolate to 1 part semi-sweet, using the traditional red, green, and white candy canes per batch. 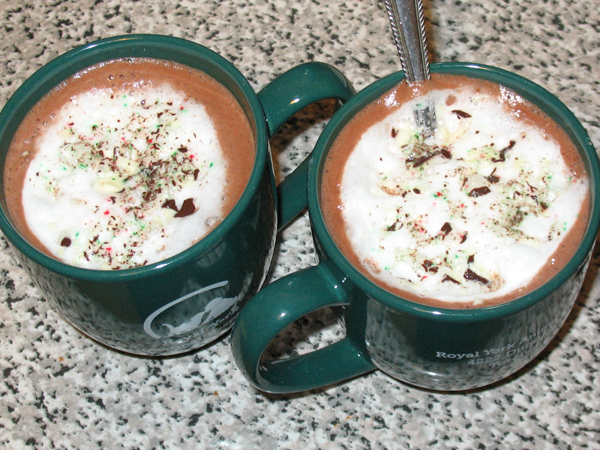 The chocolate must be tempered, so review my how-to guide before trying this. Buying candy canes after Christmas is an exercise in futility, lots of places sell out. I buy the canes in Nov, and pick up the Callebaut chocolate in Dec. Whether or not to use peppermint extract or peppermint oil depends on your taste preference, I prefer the oil which I order online from Golda’s Kitchen. Working with chocolate, you must make sure EVERY dish and implement is completely dry. 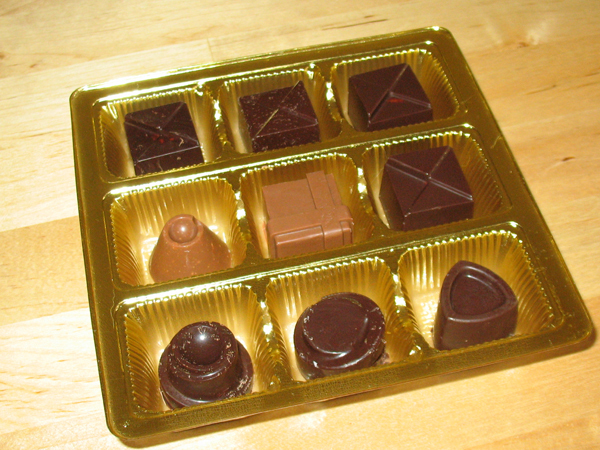 A drop of water will cause the chocolate to seize. 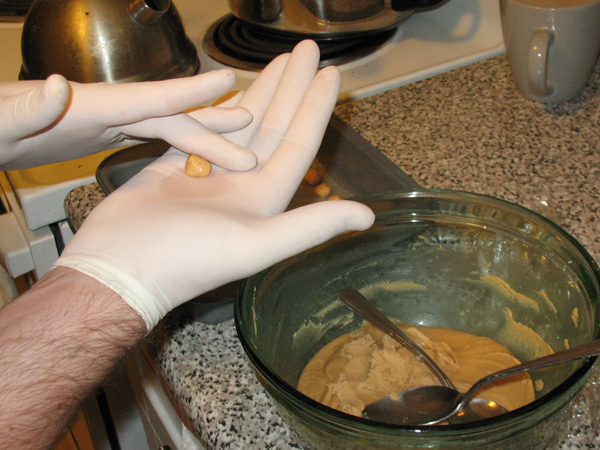 Wear latex gloves while handling chocolate to prevent the natural oils in your skin from blemishing it. The heat of your hands will also melt it, wearing gloves helps reduce the heat a bit. 1. 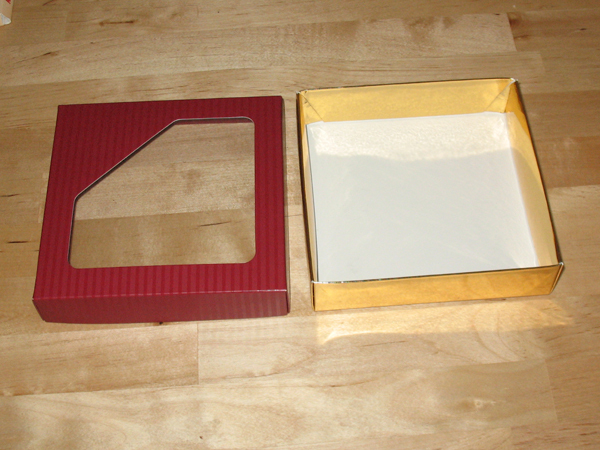 Line baking trays with wax paper. 2. 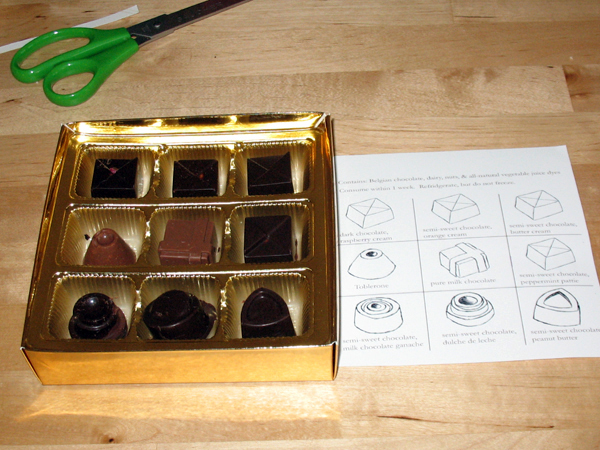 Use a serrated blade to chop the semi-sweet chocolate. Weigh out 8 oz, and divide it between two bowls: two thirds in one, one third in the other. 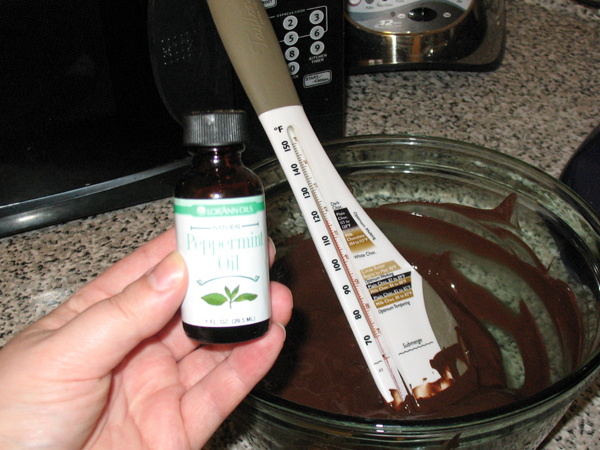 Temper the chocolate and stir in one drop of peppermint oil. 3. 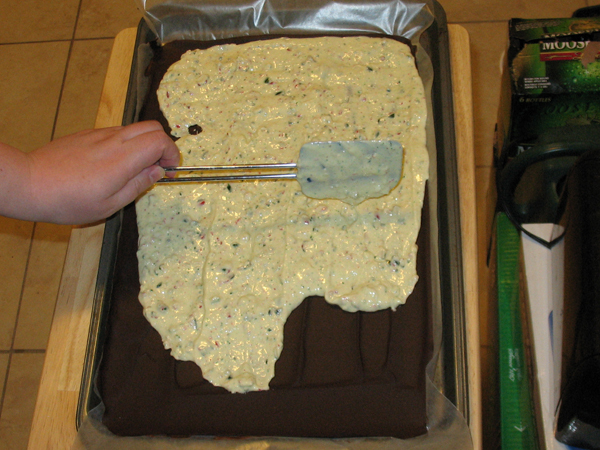 Pour the chocolate into the trays, spreading evenly with a spatula. Chill in fridge for at least 10 minutes. Take a break to wash and dry your bowls and chocolate thermometer, they must be bone dry. 4. 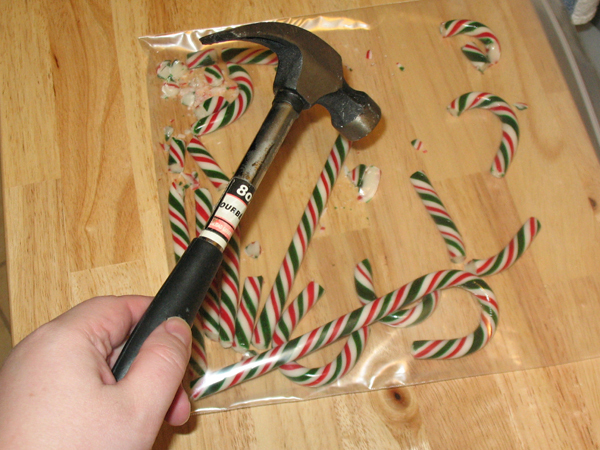 Unwrap the candy canes, place into freezer bag, and HULK SMASH!! Hammer away until you’ve got a bag of itty-bitty pieces, and set them aside. 5. 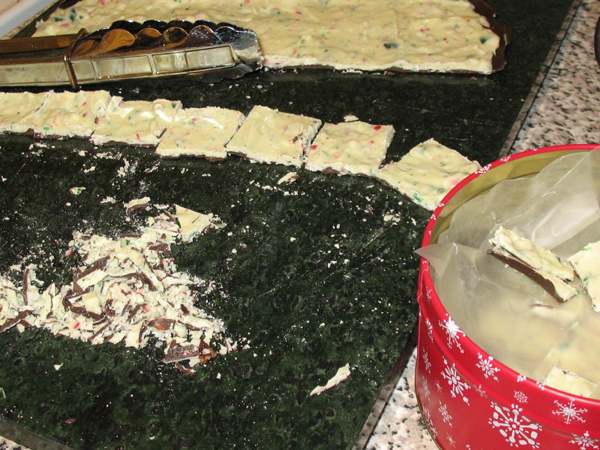 Chop the white chocolate, and temper it too! Stir in 2-3 drops of peppermint oil. 6. 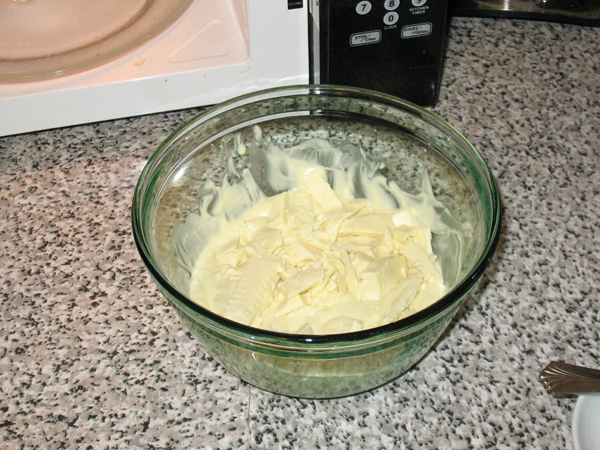 Stir crushed canes into white chocolate. 7. 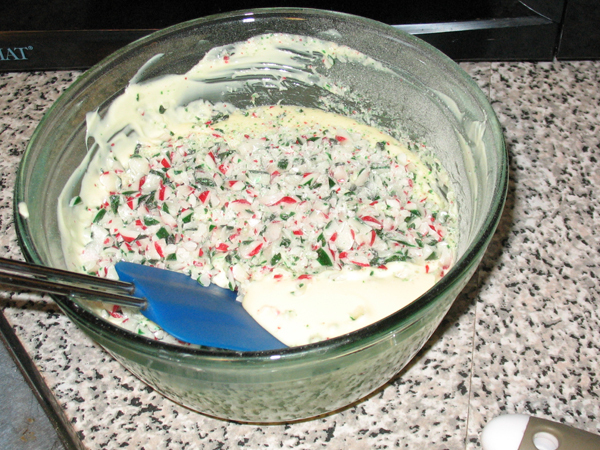 Immediately pour onto first layer and spread evenly with spatula. 8. Chill in fridge for at least 3 hours. 9. When you are ready to cut it into pieces, remove the wax paper from the bottom and let it sit on the cutting board for 10 minutes. Use a heavy blade to cut into strips. 10. 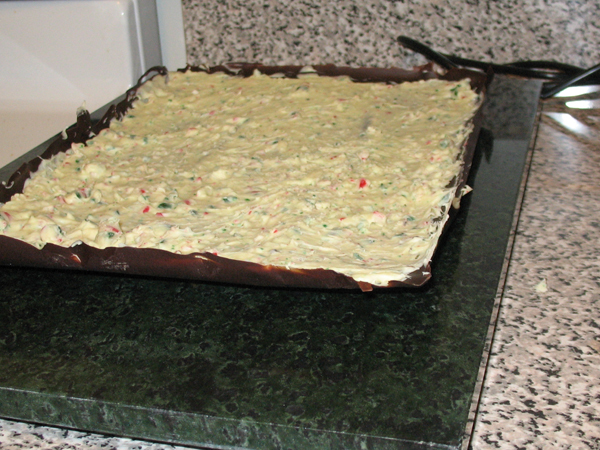 Place into tins, separate each layer with a piece of waxed paper. 11. Keep in the fridge. Allow the pieces to sit at room temp for 10 minutes before eating. 12. See all that bark dust on the cutting board? Save it as a garnish for hot chocolate with steamed milk, or pancakes!! Verdict: When I started out making bark, I used to make it with equal parts of each chocolate. My sister Chocoholic suggested decreasing the semi-sweet. I followed her advice and was really pleased with the result. Bark has a strong flavour so a thin piece is fine, using the 2:1 ratio results in perfect, delicious bark. Merry Christmas! I had an wonderful thought on making chocolates the last time I was at the grocery store. “Nevermind that!” he said, and valiantly tried to steer me away. That was the critical moment. I knew I had won. But alas, no chocolatiering for me today, I am very sick and it’s going to be a few days before I am fit for baking. 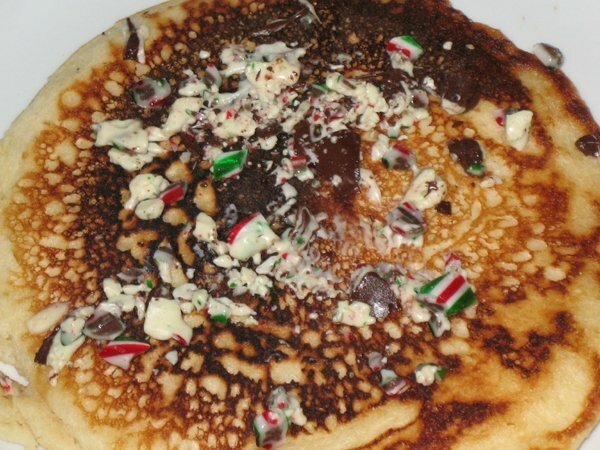 However, December is here which means: very soon I will soon be making my Christmas specialty. While I am recuperating, I’m interesting in hearing your thoughts on chocolate.